RBTH presents a selection of views from leading Russian media on international events, featuring reports on the first session of the new Ukrainian Parliament and Kiev’s preparations to terminate Ukraine’s membership in the CIS, as well as EU permanent representatives’ announcement of planned sanctions against the leadership of the unrecognized breakaway republics in eastern Ukraine. 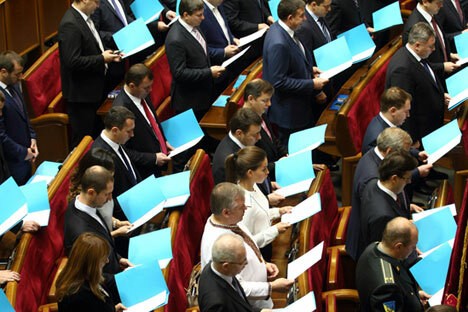 Expert Magazine reports on the first session of the new Ukrainian Parliament. As was expected, Arseniy Yatsenyuk remained President of the Cabinet of Ministers, while the chair of Speaker was given to Volodymyr Groysman. The publication notes that this fact alone represents an important victory for Ukrainian President Petro Poroshenko over the prime minister. Moreover, Poroshenko presented the deputies with a message in which he outlined the country's future course. The president announced that the established peace in the Donbass region of eastern Ukraine "does not mean an exclusion of a military threat from the East," which "will be taken into consideration for many years to come and which will require substantial efforts and enormous resources." Expert explains that Poroshenko is thus trying to maintain the level of social mobilization against an external threat, which helps smoothen the contradictions within the governing coalition and form a national self-awareness in the population. Expert also writes that the Ukrainian President backed Yatsenyuk's earlier statement about appointing foreign citizens to ministerial posts. The publication reminds its readers that Yatsenyuk was primarily talking about the Ministry of European Integration. Poroshenko suggested appointing a foreign specialist as head of the anti-corruption bureau. According to Expert, in his parliamentary address the Ukrainian president categorically rejected any proposals of federalizing Ukraine. "There will be no federalization," the publication cites Poroshenko. "This is a response to advisers in the East and in the West." He also announced his intention to cancel Ukraine's non-aligned status. The Moskovsky Komsomolets newspaper writes that Ukraine's Parliament, the Verkhovna Rada, has begun working to register the bill on terminating Ukraine's membership in the Commonwealth of Independent States. The authors of the document are representatives from the Petro Poroshenko Bloc, the People's Front, and Yulia Tymoshenko’s Batkivshchyna party. Moskovsky Komsomolets reminds its readers that on Nov. 14 Ukraine's Cabinet of Ministers liquidated the post of Plenipotentiary for Cooperation with Russia, the CIS Countries and the Eurasian Economic Community. Previously, Petro Poroshenko had recalled Ukraine's Representative to the CIS Executive Committee. The Kommersant newspaper writes that EU permanent representatives have agreed to make additions to the sanctions lists. According to the newspaper's sources in the EU, 13 representatives of the unrecognized Donetsk and Lugansk republics in the Donbass, who will not be allowed entry to EU territory, and five organizations, which will be imposed with financial sanctions, have been added to the list. The individuals and organizations were blacklisted in relation to their participation in actions that undermine Ukraine's territorial integrity. Kommersant reminds its readers that the decision to expand the sanctions was based on the illegal, in the West's opinion, elections in the Donbass on Nov. 2 and the militias' alleged increase in military potential thanks to Russia's support. Moreover, EU permanent representatives discussed the expansion of restrictions on investments in the economy of Crimea as part of "the policy of aggressive non-recognition" of Russia’s annexation of the peninsula, writes the newspaper. This decision is also expected to be taken shortly. Kommersant sources do not exclude that during the EU summit in Brussels in December a series of European leaders will raise the issue of expanding sanctions against separate sectors of the Russian economy. Meanwhile, German Foreign Minister Frank-Walter Steinmeier warned that calls for new sanctions against Russia demonstrate "a dangerous incomprehension" of the situation, writes the newspaper. "An isolated, economically weakened Russia cannot make a contribution to the stabilization of Ukraine, but can become a great danger to itself and to others, which is why I do not recommend this path," Kommersant cites the German foreign minister as saying.